We’re quickly approaching the deadline for submissions to the June 2012 edition of the Headache & Migraine Disease Blog Carnival, which we’re hosting here at Migraine.com this month. As always, posts on any topic related to migraine disease or other headache disorders are also welcome. However, be aware that on-topic submissions will be given priority by being placed before off-topic submissions in the carnival blog post. The June edition of the carnival will be published right here at Migraine.com on Monday, June 11, 2012. If you don’t normally blog but would like to share your thoughts on this topic, I recommend you create a public Facebook note and submit the link to that. (1) Your name as you would like it to appear in the carnival. (2) The title of the blog post you’re submitting. (3) The url of the blog post you’re submitting. (4) The title of your blog. (5) The url of your blog. For more information about the carnival visit the overview page here: Migraine Blog Carnival. Most of the frequently asked questions about the carnival are addressed here: Headache Carnival FAQ. Please don’t hesitate to let me know if you have any questions. I’ll check back to answer any questions left in the comments to this post, but you can also email me at the address listed above. Also, please be aware that I’m always looking for participants who are willing to volunteer as hosts. It’s not only a great way to support the carnival, but also to drive new traffic to your blog! A blog carnival is a collection of links to blog posts on a central topic or theme. 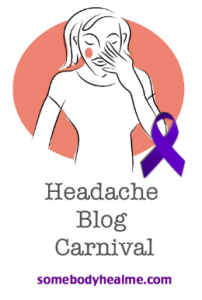 The Headache & Migraine Disease Blog Carnival provides headache disorders patients and people who blog about them with the opportunity to share ideas on topics of particular interest and importance to us. The carnival is held monthly and published on the second Monday of each month. For more information visit: Headache & Migraine Disease Blog Carnival.